Corporate glossaries can be a great asset to any company striving to standarize the terminology in their company literature. 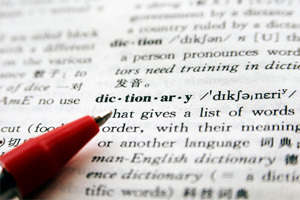 Premier Focus Translations offers glossary development and will assist you in creating a corporate glossary. Terminology from marketing materials, annual reports, your website can be included as well as terminology from previously completed translations. The completed glossary can be used for future translation projects and will ensure a streamlined company image. Please get in touch with us to obtain a no-obligation quote for the development of your glossary. This service is subject to a charge per hour. Prices vary according to language combination, complexity of the source text and required turnaround time.